Just because something is custom made, doesn’t mean it has to be a hassle. Here’s how you can order your own custom plantation shutters without any hassle. Making design improvements to your home does not have to be a headache. 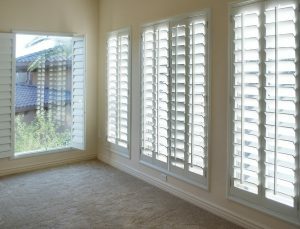 There are many custom specialists out there ready to provide the special shutters or room darkening solutions you want. These professionals know the ins and outs of home design, they just need to know the vision you have for your space. Even the elegance of plantation shutters can be achieved with eases. All it takes is knowing how to specify your customized needs. Keep reading for all the knowledge you need to make a stress-free order. Plantation shutters are beautiful additions to any window. They are panels meant to balance the level of light entering the room, similar to blinds. However, they can do much more. These shutters boost the aesthetics of any room. They can easily swing on hinges to allow the most light to enter a space, or you can fold the panels all the way back. They even improve insulation quality of your home. When placing your custom order, specify the look you want to achieve in your space. You can choose between the classic, full-length shutters that open as one panel. Or, opt for cafe-style half panels that fold open. You can also stack half panels on top of each other to add more dimension in the room. Once you know the basic frame you want, pick the size of the louvers. Large louvers can be as big as four inches. They allow more natural light to enter the room, which works great in living rooms and kitchens. Smaller louvers range around two and a half inches. These block more light, which can work well in a dining area or a bathroom. As you consider sizes, decide how you want to open and close the louvers. Pick a divider rail and choose between a traditional tilt or a rear tilt. After establishing all the details for the look you want, decide how you are going to hang the shutters. Plantation shutters can be mounted on the inside or outside of your window. The best way to decide what will work in your home is to check your window moldings. If there is already a trim around your windows, your order will be easiest to mount inside. This requires an L-shaped frame for traditional shutters. You can also opt for a hinge-only frame, which allows you to open the shutters all the way. For windows without any moldings, it is best to choose an outside mount. The process is much easier and you can even add more aesthetics with a decorative L-shape frame or a Z-frame. Removing the stress around home decorating can be as simple as understanding your options. Once you know the differences between panels, louver sizes, and mounting, it is easy to communicate the look you’re going for. Talk to your window decorator about the options and services they provide. Double check your order and ask their opinion, too. Before you know it, you’ll have the beautiful plantation shutters you hoped for. Ready to begin one of the easiest home projects ever? Click here for more on our custom shutters. There are many different types of Window Blinds and Shades currently on the market so how can you know which one is right for you? In general window coverings are divided into two categories “Hard Window Coverings” and “Soft Window Coverings”. Hard Window Coverings are usually broken down in to two categories consisting of window blinds and window shades each of which contain many different products. Soft Window Coverings are decorative window treatments usually made from fabric by the yard. Products such as Draperies, Swags, and Valances all are considered products within the soft window covering category and are often used to “dress up” the Hard Window Coverings. So with all of these choices how does the average person select the window covering that is right for them? There is no simple answer to this question because decorating is like choosing a flavor of ice cream some like chocolate while others prefer vanilla. With that in mind I will attempt to lay some ground rules that apply when choosing the correct window covering for you. In this article I will focus mainly on “Hard Window Coverings” these are typically the functional part of the window covering and as stated earlier consist of mainly window blinds and shades. Watch for future articles that will focus on “Soft Window Coverings”. If I had to guess I would say, that 95% of all households in America that have windows have at least one window blind or shade covering a window. There are many different types of window blinds and shades on the market today and new products are always popping up. Up until recently the “hard window coverings” category was divided into two categories Window Blinds which are window coverings with some type of movable louver or slat to control light and privacy and Window Shades usually some type of solid fabric that must be raised or lowered to control light and privacy. Now there is a third category often referred to as “Window Shadings” these are products such as Shangri-La shades that actually combine the functionality of a Blind with the Soft look of a shade. When choosing the best window blind or shade for your window the first question you must ask your self is “What do I want from the window covering?” Is light control the most important or is Privacy the most important feature? It may be that you want both, or it may be that you just want your windows to look beautiful with little regard for light control and privacy. What ever it is you are seeking from your window blinds and shades it is important that you understand the functionality of each product in order to make an informed decision. Going forward I will outline each hard window covering product currently available on the market that will assist you in making an informed decision when shopping for window blinds and shades, and let’s not forget the window shadings. Window blinds such as, Wood Blinds, Faux Wood Blinds, Mini Blinds and Vertical Blinds are all slatted blinds that control light by rotating or tilting the slats (sometimes called Louvers). These blinds are the most versatile because they need not be pulled up or stacked to see outside your window. The amount of light entering the room and the privacy level is controlled by simply rotating the slats or louvers. Blinds such as these are typically considered more “casual” when decorating and are often used in less formal areas of the home such as, Family rooms, children’s bedrooms, Bathrooms, and Kitchens. Of course there is no rule that says you can only use these blinds in certain rooms but remember that decorating is very subjective and if you are happy with the way something looks in your home then it is the right choice for you. Window Shadings is a new window covering category that was introduced by Hunter Douglas about 20 years ago with the introduction of the Silhouette® shade. Window shadings incorporate the versatility of a window blind with the soft look of a window shade. These shades often have a fabric slat that can be opened or closed for light control and privacy along with a sheer fabric facing for a soft uncluttered look at the window. They can be raised and lowered like a window shade or they can remain in the lowered position to operate the fabric louvers just as you would operate a window blind. These shades are typically higher priced and are used in Living Rooms, Dining rooms and Master Bedrooms. They are truly unique in appearance and typically draw a lot of attention to the window. If you are looking to increase the “WOW” factor of any given window then Window Shadings is the choice for you. Since the introduction of this Window Shading Category products such at Shangri-La have evolved and made this window covering category a bit more affordable while still capturing the same “WOW” factor. Choosing the correct window covering for your windows really comes down to what you feel comfortable with. As I mentioned earlier decorating is very subjective and there is no right or wrong way to decorate, or to treat a window for that matter. If the window treatment you want to use looks right to you then it is. Don’t let your neighbor convince you otherwise or you will just be unhappy with your choice. I have been covering windows now for about 27 years, and the one thing I have learned is that there is no such thing as a right or wrong window covering. Of course you can use my notes about each product as a guide when choosing a window blind, shade or shading but ultimately the choice is yours and what ever you choose will be the right choice for you. This article is a very general overview of the products currently on the market, as time goes on I will publish articles that are more product specific so stay tuned!